This crane is a premium quality machine with a durable wooden cabinet and metal control box. 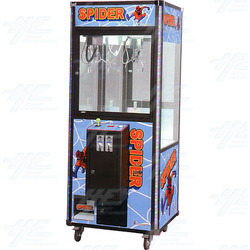 It is manufactured in Taiwan and has a number of features that make it superior to many other crane machines in the market. The machine features a removable operations door that allows for convenient access and maintenance. Also maximizing convenience is the ability to digitally adjust the power of the claw through the pushbutton and joystick. The stand out feature of the premium crane machine is the drop tray sensor that calculates the machine's payout percentage. The sensor keeps track of how much money is inserted into the machine and how many prizes are dispensed on a weekly basis. The medium sized cabinet can be configured with either a 200mm or 270mm claw, making it suitable for prizes such as plush, watches, charms and capsules. The 200mm claw can hold gifts weighing up to 500g, while the 270mm claw is appropriate for prizes up to 550g in weight. These crane machines can be fully customized with your company's colours, logos and artworks. Vending: Play until you win. When the amount of the coin inserted is equal to the preset prize value, the game will start. The game will only end when a prize is won (detected by the drop tray sensor). Gaming: Standard option. When the amount of the coin inserted is equal to the value of one game, the game will start. The game will end after the claw's first descent. The probability ratio of the strong and weak claw power is based on the weak claw. For example, if the weak claw power is set to 90, the claw will be set to weak 90% of the time. The stronger claw power will appear only 10% of the time. Accumulating: Once the amount of the coin inserted is more than the preset prize value, the machine will enter Vending Mode. Once a prize has been one, the machine will return to Gaming Mode. Time Limited: Operates the same as Accumulating Mode however the play has to be made within a preset time limit. Random: This mode operates similar to Gaming Mode, but the strong claw power will only appear once in a predefined period. 2 Extra Large: 270mm in size, can hold goods up to 550g.